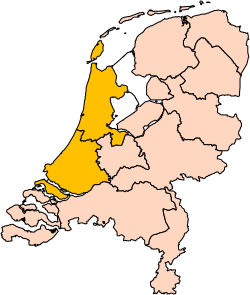 Holland is a region an umwhile province locatit on the wastren coast o the Netherlands. The name Holland is an aa frequently uised as a pars pro toto tae refer tae the whole o the kintra o the Netherlands. This uisage is generally acceptit, but some individuals, parteecularly frae the ither pairts o the Netherlands, dislik the uise o "Holland" as a substitute for "the Netherlands". ↑ "Holland or the Netherlands?". Dutch Ministry of Foreign Affairs. Retrieved 15 December 2012. This page wis last eeditit on 25 Mairch 2017, at 18:25.